You’ll receive a warm welcome at 2 Cambridge Villas from hosts Kate and Mark! 2 Cambridge Villas is a Victorian Lakeland town house built around 1840 as a domestic residence, becoming a B&B in the mid-1970’s. 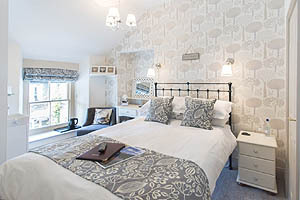 Our guests will find a home away from home providing a relaxing stay in one of the 5 en-suite rooms, all beautifully decorated, furnished and centrally heated with room thermostats. To make your stay comfortable you’ll find tea/coffee trays, toiletries, hairdryer, flat screen tv and free Wi-Fi, plus a few little luxuries to make you feel perfectly at home. 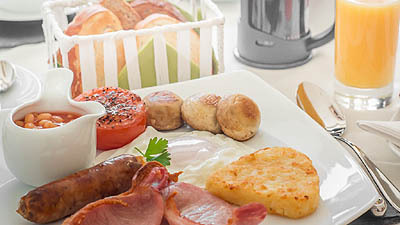 We serve a hearty home-cooked Cumbrian breakfast for our guests. 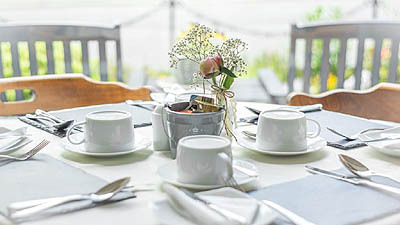 There are vegetarian and vegan options plus a choice of cereals, porridge, yoghurts, fruit juices, fruit salad, croissants, toast and preserves. We use local produce wherever possible and our bread and preserves are all home-made by Kate. We can supply packed lunches and you’ll often arrive back to freshly baked cakes after your day out in the fells or sight-seeing! All five bedrooms have recently been completely refurbished. 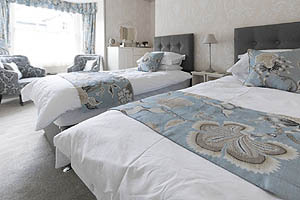 We offer double, twin, family and single rooms (single rooms subject to availability). A travel cot and high chair are available for young visitors. 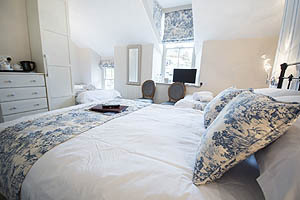 All rooms are en-suite, all with individual character, bespoke furnishings and most importantly comfy beds for a good night’s sleep! Mark and Kate both know the Lake District very well having worked here as walking guides and mountain activity instructors for many years. 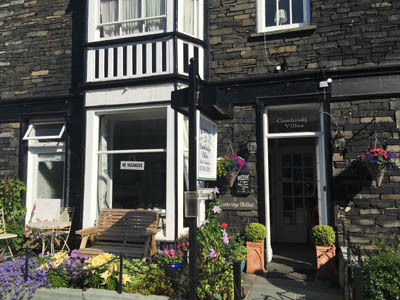 We are happy to offer advice on where to go or what to do whether it’s big mountain walks, gentle strolls, bike rides or sight-seeing to help make your stay memorable. A selection of maps, guide books, walking poles and umbrellas are available for all guests. There is also useful bike storage and drying facilities for those days when you arrive wet.